4/25: Pool directly across the street! Property Size 1,349 sq. ft.
"Bring your Pets! Pet Friendly! Beachbum's Bungalow reminds you what staying at the beach is all about. The tropical colors of the house and new landscaping welcome you. After entering the front door you will feel right at home with the open floor plan. The inviting Living Room reflects the laid-back, Florida beach lifestyle! Large HD flat screen TV, BluRay and stereo bring the comforts of home to your get away. The Dining Room is accented by a bay window and is open to the Kitchen. The aqua-colored tile countertops capture the color of the beautiful Destin beaches. A fully-equipped kitchen, with modern appliances, allows you to prepare as many meals as your heart desires. With a gas grill off the back porch, who needs to go out to eat? Off the kitchen is a stackable washer and dryer to keep those beach towels fresh! How does a cool glass of lemonade sound? Enjoy sitting on the back or front covered porches watching the sun melt away. Beachbum's Bungalow sets itself apart from all the rest with an amazing split floor plan. The master bedroom has a private entrance to the covered back patio. The HD flat screen TV and BluRay will entertain you or you can choose to soak away the day in your master bathroom which features a separate tub and shower, double vanity and walk in closet. On the opposite side of the house you will find extra space for everyone. The second bedroom offers a Queen bed with HD flat screen TV and BluRay. The third bedroom maximizes its space with a double bed and twin bunk beds. This room also features HD flat screen TV with DVD. Along with all the great things this property offers, it is right across the street from the community pool for your enjoyment. 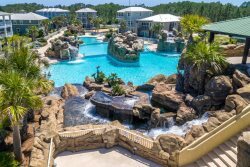 After enjoying the pool, just a short stroll down the street will take you right to the Emerald Coast Beaches." Add $175 for housekeeping and 11% for tax. $69 damage protection fee; 2.5% processing fee on credit card payments. 25% is due at booking which holds the unit for you and is applied toward your rental fee. Full payment is due 30 days prior to your arrival.